Nissan has unveiled the Nissan Energy Home, a demonstration house that shows how electric vehicles can help provide power for a home’s energy needs. Located in the Nissan Global Headquarters Gallery in Yokohama, the demonstration house features solar panels and a Nissan LEAF electric car that provides power from its battery pack. The Nissan Energy Home allows guests to learn about Nissan Energy, the company’s vision for connecting homes, cars and power grids, which was announced today. 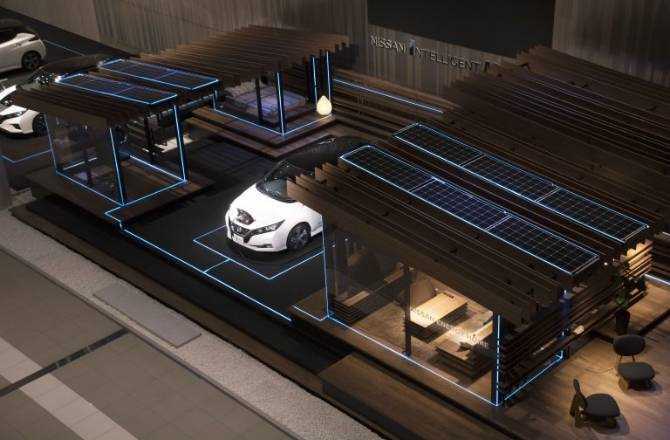 Nissan Energy envisions a connected world where new developments in battery usage and power generation enable homes and vehicles to better harness energy and to power each other. 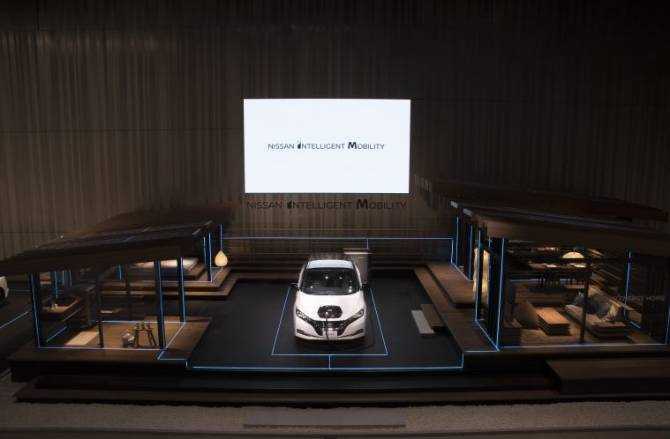 This is a key aspect of Nissan Intelligent Integration – a pillar of Nissan Intelligent Mobility, the company’s vision for changing how cars are powered, driven and integrated into society. At the heart of the Nissan Energy Home is a vehicle-to-home system. The system charges the connected electric vehicle, which then shares power with the home. This demonstrates Nissan Energy Share by using Nissan’s electric vehicle technology to store, share and repurpose energy. During the day, when the sun is out, the solar panels generate electric power and forward it to the Nissan LEAF battery pack for charging. The LEAF assumes the role of an energy storage unit while the solar energy is harnessed. When the sun goes down, the home’s electrical demands are managed by the Nissan LEAF to power lighting, air conditioning, televisions and even cooking appliances. The needs of a typical house can be provided using a small percentage of the battery capacity, leaving plenty of range for driving. The next day, the cycle is repeated. Nissan Energy Supply provides connected charging solutions that customers may need at home, on the road and at their destination. Electric vehicle owners typically do the majority of vehicle charging at home, and the Nissan Energy Supply service verifies whether charging equipment, such as electrical sockets, wall boxes or power control systems, can be connected to Nissan electric vehicles safely. The Nissan Energy Home was designed by the company’s global “space design team,” headed by Alfonso Albaisa, senior vice president of global design. Wrapped in wood and clear walls, it expresses both Japanese tradition and modernity, with a sense of nature and sophistication. Along the flooring and walls, blue illuminated power strips show the flow of energy from the solar panels or the Nissan LEAF battery. The open-air layout, with walking paths to each room, allow guests to move as freely as the energy moving around them. The Nissan Energy Home isn’t a distant dream or future; it represents the possibilities of today, using existing technologies. Nissan Energy’s capabilities, whether it’s Nissan Energy Share or Energy Supply, can also be used as part of emergency relief efforts where the established power grid isn’t available.